What: I am using a Storch Leo wrap conversion ring sling. I was voting in our local election and Ivy was there to support me! Why: Babywearing in my ring sling is super practical for quick ins and outs while running errands. 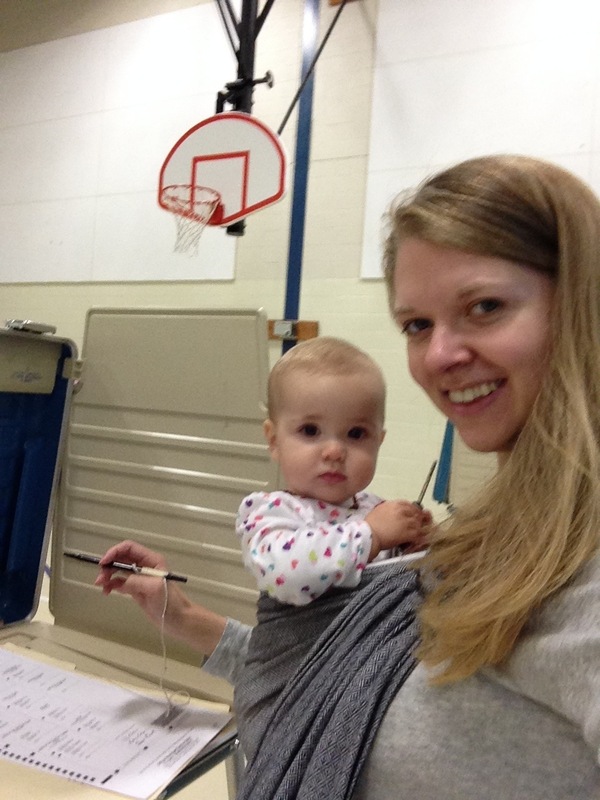 Since today’s election was not “big one”, I knew I wouldn’t have to stand in line for long, so using my ring sling was an easy way to quickly get Ivy out of the car, carry her into the polling place, and also leave my hands free to fill in the ballot bubbles! I think voting is extremely important (even in minor elections), and I want Ivy to learn all about the way we elect our officials. I was thrilled that she could join me and be high enough up to see what was going on while I voted! I know she’s not old enough to understand what was going on, but it’s still a great way to introduce her to her civil rights and duties, and babywearing made it possible!